This was an amazing discovery by Pete Simpson in October 2016. He was driving down a highway at 90kph when he spotted an interesting bird flying in the opposite direction. He hesitated a bit before turning the car around to get a closer look. After some observation, he discovered that there was a pair. He found it unusual for rare migrants to be found in a pair. From the behavior he observed, he suspected they might be nesting. Soon after, he found the nest hole with two chicks. 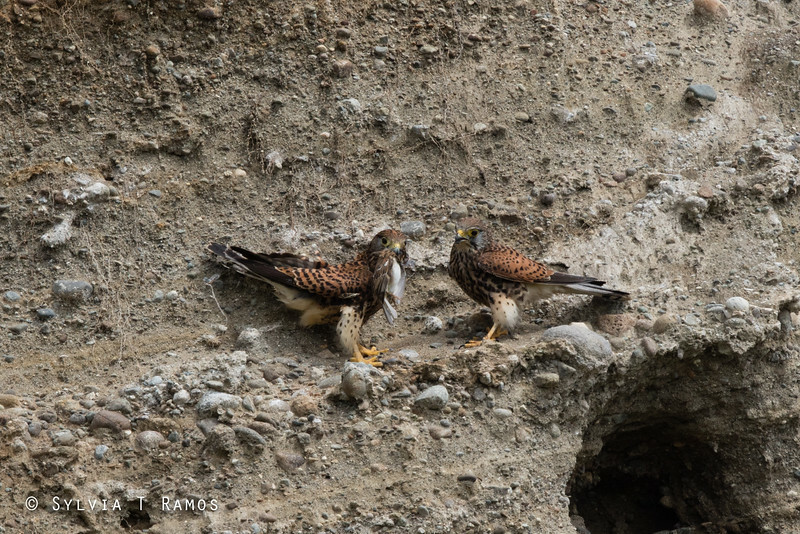 This is the first time Spotted Kestrel is recorded in the Philippines. They were previously thought to be an endemic of Indonesia. When we went to see the birds we were able to observe them feed the chicks. The male flew in and perched on the ledge with a Eurasian Tree Sparrow in its claws. The female flew to the male and the male immediately gave the prey to the female. The male flew and perched in a different ledge. The female removed the feathers from the Eurasian Tree Sparrow and brought it to the nesting hole. She fed it to the two chicks. When seen in flight, the female has visible barring on the tail. The male does not.